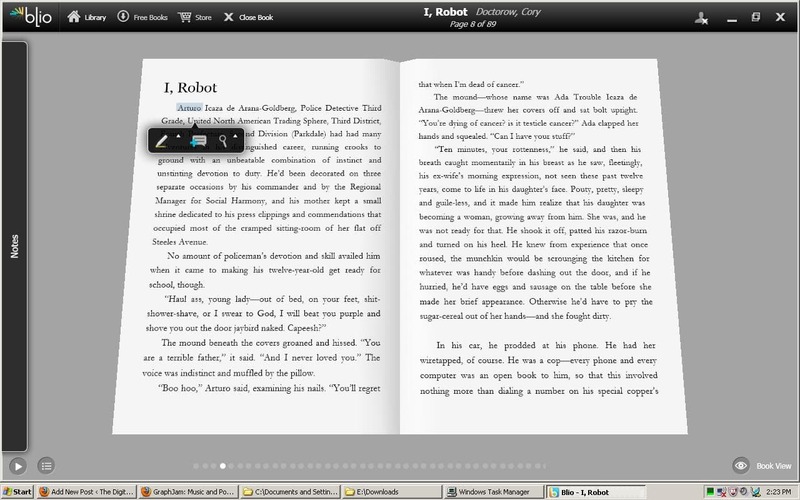 The Blio reading app was finally available for download today, and I got it as soon as I could. I was really looking forward to this; the demos were impressive. The faux 3D mode looked interesting, the TTS sounded good, and there were hints that even better features would be coming. Given how wonderfulness of the demo, I'm a little surprised at how awful my reading experience was. The TTS was horrifyingly bad. I was slapping at my keyboard (trying to turn off the sound), it was so bad. Think bad 19080's SF movie, and you begin to appreciate the sound. What's even worse is that TTS on the Kindle was so much better! That should not have been possible; my laptop has significantly better hardware specs than the Kindle. The faux 3D mode was also pretty bad, and I really don't understand why. The edges of the faux page were jagged. (Check out the screen shot.) This shouldn't have been hard; writing software for this kind of perspective is a homework assignment for college juniors, now. There are a number of other viewing modes (single & double column, double paged, etc) but they're really nothing more than you can find elsewhere. I'll skip them here. Actually, I want to point out the double page mode. This mode rises to the point of FAIL. You see, I was reading a book I downloaded from Feedbooks. It started out as Epub, and in converting it to Blio format it became some horrifying mutant PDF format. When I zoomed in in the double page mode, text disappeared off the bottom and top of the screen. I would expect this with a PDF, but I stared with an Epub. It really should have reflowed the text, not made it disappear. And one last point before I go. One of the features we were promised was Epub support. I remember this quite clearly. Unfortunately, Blio won't open an Epub file, so I can't read any of my current library. Do they really expect me to buy my existing library a second time? Given that there are only about 6k titles in the Blio ebookstore, I really have to wonder what they were thinking. P.S. And if you think I'm pissed, you should check out what Mike Cane wrote. Oh, you could DO something in 3D mode? I thought it was just for the silly pretteh, not to actually touch any of the text! I didn’t even try TTS. The only reason I ever heard TTS on a Kindle was that the J&R salesperson forced it on me. Someone at my blog pointed out the lack of ePub too. I didn’t even think about ePub, since the Larsson books were being sold in Blio format(!!!). So, Kurzweil has his own little walled garden of eBooks set up now. FAIL. Is there a summary somewhere of how Blio is supposed to be better than PDF? I tried it for 10 seconds then deleted it. No need for it and the four free books I guess were given as tech demos because they are nothing to write home about. Blind and vision impaired users were screwed by blio also, we were promised universal accessibility but it doesn’t work with the latest screen readers except for two, and it won’t be fixed for a month. Also the National Federation of the Blind also supported this. With limited epub choices for blind users, a pretty big epic fail indeed. Thanks for checking the compatibility. Blio just gets worse and worse. Fixed for a month? not fixed. You don’t release a program to the public and assume its gunna work on every single computer out there. After the public confirms the main problems they can be fixed. Then there could be a stable version…especially for the blind. ALSO BLIO, which is the correct spelling, was intended for the general public. Also that screen shot, clearly you have a junk graphics card. Anti-Aliasing???….. for someone reviewing a computer program, you should probably know something about that. Clearly NOT. I have the stock Intel graphics chip that came on my laptop. It’s more than enough for my other apps, _and_ it met the reqs for Blio. It’s not my fault the hardware reqs weren’t high enough. You know “Requirements” they always say that it will work. You know….back of the box. Then you get home and realize it barely runs that! Its not your fault, but you should be able to choose what programs need AA. Didn’t know about this site, great job! As a blind computer user, O what a falling off was there with Blio. What was NFB thinking? There have been some presentations on blind-oriented podcasts about the wonders of Blio, and now this! Kindle’s restrictions on TTS and the difficulty of setting it up with no-vision as opposed to low-vision have come in for some heavy crits, but this situation makes Amazon look really good! Again, glad to have discovered this group and beautifully simple site! I spent about 10 minutes yesterday with it before deleting it. I had pretty much decided it wasn’t worth keeping after 5 minutes but kept tryig to find some reason to keep it. Unfortunately I couldn’t find any reason. After reading some comments about the EULA and re-reading it I can’t think of a reason to ever try it again. Thats one scary EULA.